Office Mix is compatible with MS Office 2013 and Office 365 and helps to create engaging presentations using screen capture, audio recordings, onscreen notes, embedded live websites, and more. Please note that Office Mix is only available for Windows/PC users! Navigate to the Office Mix website and click Get Office Mix. Next, open the installer and PowerPoint will launch with Office Mix installed. You’ll see a new MIX ribbon along the top of PowerPoint. 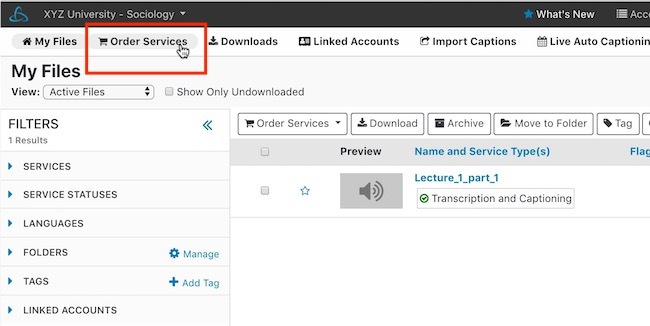 Use the Slide Recording feature on the new Mix panel to record narration over your slides and also record animations and interactions with your content. Note: In order to eventually export your presentation as a Mix, make sure you save your PowerPoint file in .pptx format. Navigate to MIX > Export to Video and then select your video resolution based on the playback device. Please note that a high resolution .mp4 is not required for the transcription process. Name the presentation and save the .mp4 file to your computer. Log into your 3Play Media account and navigate to Upload Media > Upload Media. Select the MP4 from your computer and follow the additional prompts to specify turnaround as well as a destination folder. See more information on how to upload a video directly from your computer for the transcription and closed captioning service. Upon completion of the transcription process you will receive an email notification that your captions are available for download. When the file has been complete log back into your 3Play Media account and download the file in the DFXP closed caption format. See more information on how to download a file to your computer. Office Mix only accepts caption files in TTML (.ttml) format. Open the DFXP caption file in a simple word processor like Notepad. Add “.ttml” to the end of the file name. Under Save File Type As, select All Files. Click Save to convert the DFXP to a TTML file. 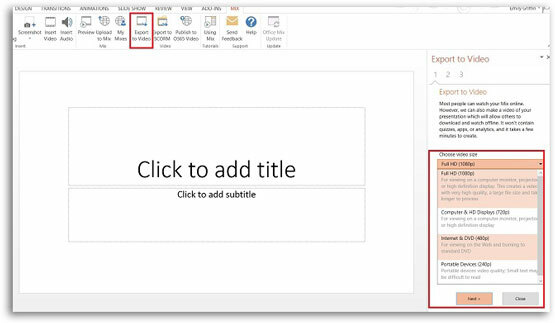 Open your PowerPoint document and click on Upload to Mix. In the Upload to Mix panel, click Next and sign in using either Microsoft, Google, or Facebook login credentials to access files stored on the cloud. In the next pane, select This is a New Mix. Be sure to check the box under Enable playback on mobile devices as this will create a video giving your users the ability to view the Mix offline and on mobile devices. Please note that this is REQUIRED in order for the closed captioning feature to function. Once uploading the mix is complete click Show Me My Mix. In the Closed Captioning section, click on Upload TTML File. Select your TTML caption file from your computer and upload it.